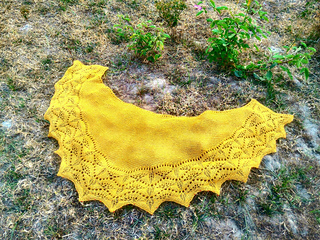 53″ [135 cm] wide, after wet blocking. 18” [46 cm] deep at center x 7” [18 cm] wide at the ends. 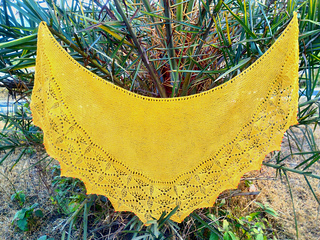 Autumn Gold Shawl is a light-weight, crescent shawl that uses the Ginkgo leaf lace pattern. The Ginkgo tree is a traditional symbol of agelessness and timelessness. The fan-shaped leaves turn a golden yellow during fall, giving the tree its characteristic name – Autumn Gold. 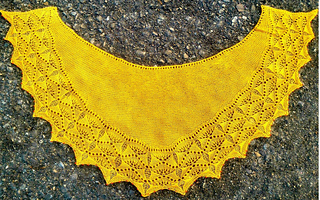 The Ginkgo leaf lace stitch lends great texture, character, and sophistication to the shawl, while also making for an interesting knit. 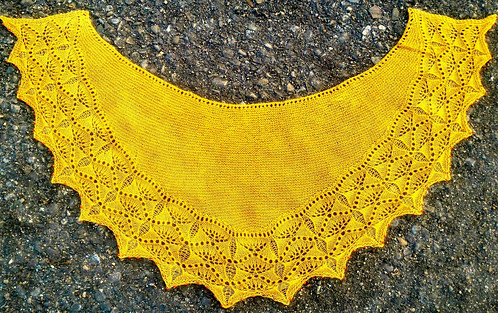 Combine it with delicate, solid, tonal or gradient yarn, and you have an heirloom piece that can be passed from mother to daughter. 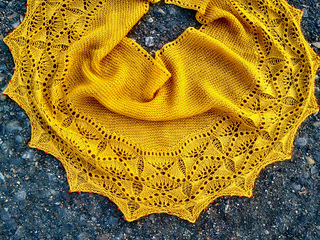 Knit in Eden Cottage Yarns Milburn 4ply in the glorious Harvest Gold shade, the shawl works up like a treat! 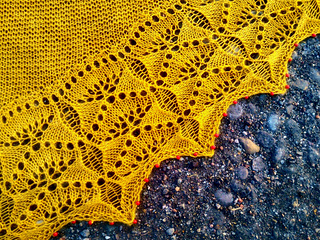 53″ 135 cm wide, after wet blocking. Approx. 105 size 6/0 (4 mm) beads, 18 removable stitch markers, tapestry needle or crochet hook to weave in ends, blocking pins/wires. 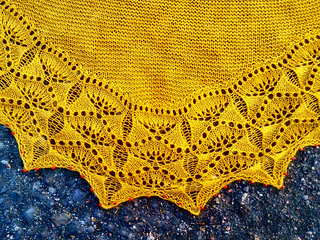 20 sts and 28 rows = 4” 10 cm in St st after wet blocking on smaller needles.